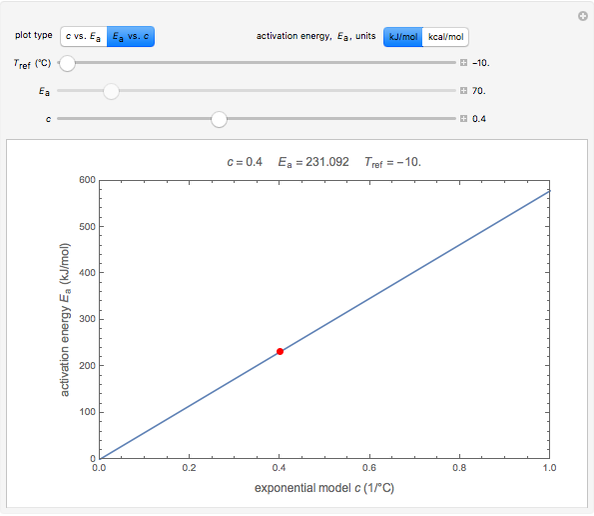 At temperatures around some appropriate reference temperature , a chemical reaction&CloseCurlyQuote;s rate constant , represented by the Arrhenius equation, can also be described by a simpler exponential model. 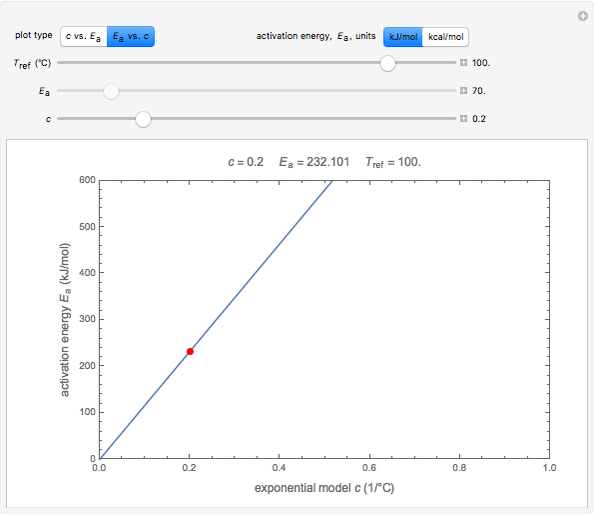 This Demonstration converts the Arrhenius equation activation energy (in kilojoules/mole or kilocalories/mole) into the exponential model parameter (in ) for a chosen . Similarly, it converts the exponential model parameter into a corresponding activation energy as defined by the Arrhenius equation. 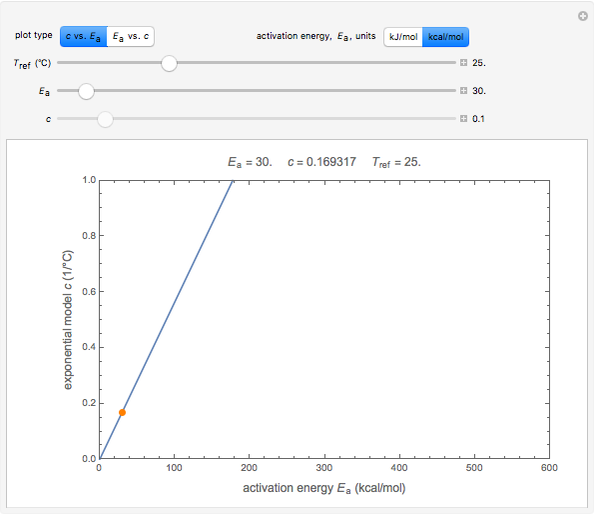 The conversions permit using published values in software for predicting degradation and synthesis patterns written for the exponential model, or comparing calculated values with known activation energies. The temperature dependence of chemical and biochemical reaction rate constants has traditionally been described by the Arrhenius equation. 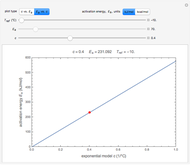 This model can be written in the form , where is the rate constant at temperature in K, is the rate constant at a reference temperature , also in K, is the activation energy in, for example, kilojoules or kilocalories per mole, and is the universal gas constant in commensurate units. 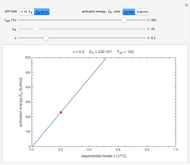 It can be shown that for an appropriate temperature range around a realistic , the Arrhenius equation can be used interchangeably with the simpler exponential model , where both temperatures are in °C and is a constant with units [1–4]. This follows from the fact that is the first term in the Taylor expansion series of at , in a rapidly converging series . 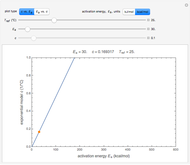 These conversions enable one to use the exponential model and software to predict the progress of reactions and processes with published values (see Related Links). They also allow you to compare published or calculated values with those of the traditional and more familiar activation energy . M. Peleg, M. D. Normand, and M. G. Corradini, "The Arrhenius Equation Revisited," Critical Reviews in Food Science and Nutrition, 52(9), 2012 pp. 830–851. doi:10.1080/10408398.2012.667460. M. Peleg, M. D. Normand, and A. D. Kim, "Estimating Thermal Degradation Kinetics Parameters from the Endpoints of Non-isothermal Heat Processes or Storage," Food Research International, 66, 2014 pp. 313–324. doi:10.1016/j.foodres.2014.10.003. M. Peleg, A. D. Kim, and M. D. Normand, "Predicting Anthocyanins' Isothermal and Non-isothermal Degradation with the Endpoints Method," Food Chemistry, 187, 2015 pp. 537–544. doi:10.1016/j.foodchem.2015.04.091. M. Peleg, M .D. Normand, and T.R. Goulette, "Calculating the Degradation Kinetic Parameters of Thiamine by the Isothermal Version of the Endpoints Method,&CloseCurlyDoubleQuote; Food Research International, 79, 2016 pp. 73–80. doi:10.1016/j.foodres.2015.12.001. Mark D. Normandand Micha Peleg "Exponential Model for Arrhenius Activation Energy "